Nas Daily Eyes Office Next To Facebook At Marina One Tower - Will Be Hiring In "Next Few Months"
Popular travel vlogger Nuseir Yassin of Nas Daily has landed in Singapore yesterday (April 17) with his girlfriend Alyne Tamir. Last month, the couple announced their move to Singapore to set up a new company called the Nas Daily Media Company. They have yet to secure a location for the office, though Nuseir has formerly expressed his ambition to set it up next to Facebook’s office at Marina One Tower. For now, the couple will be staying at Winsland Serviced Suites by Lanson Place near Orchard Road, which will serve as their home and office until they purchase a house. Singapore property marketplace 99.co has issued them a challenge to find their dream home (and office) via their platform. In return, 99.co will pay for up to 3 months of their housing rent, capped at S$15,000 in total or S$5,000 per month. Nuseir’s girlfriend has since replied to 99.co and accepted the challenge. “Travelling for three years leaves you with no residency, no place to call home, and I finally want to settle in a place,” Nuseir told TNP. This Saturday (April 20), Nas Daily will be holding a fan meet at the Botanic Gardens from 4pm to 6pm. In a Facebook post, Nuseir told fans to meet him near the MRT exit, at the lawn by the Eco Lake. “Bring a towel and friend — it’ll be one giant picnic. Rain or shine, we’re doing it live!,” he wrote. Other content creators such as Project Nightfall, Franco Dubini, and his girlfriend who is behind video series ‘Dear Alyne’ will also be present at the meet. 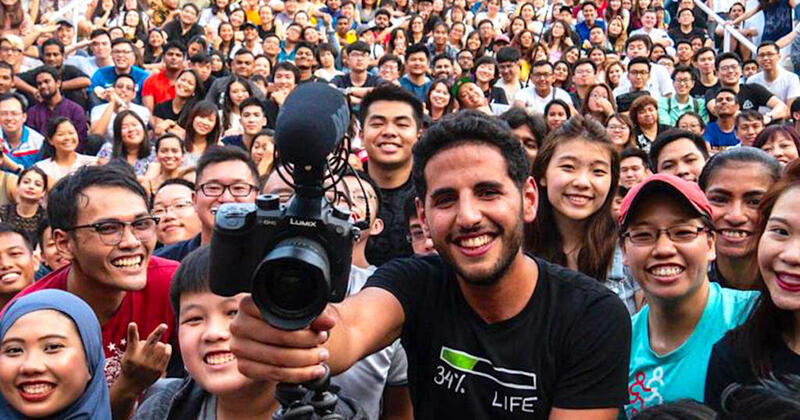 Popular travel vlogger Nuseir Yassin, better known as the founder of Nas Daily, is moving to Singapore this coming April. In an Instagram post on Wednesday (March 20), his girlfriend Aylne Tamir announced that she will be relocating to Singapore with Nuseir and his media company. She described Singapore as the “hub of Asia, and arguably a major hub of the world”, and added that they could be staying here for “two months or two years”. With plans to arrive in Singapore by April 20, Nuseir said that he intends to set up a video production house here. He will be here on the EntrePass, a work permit that allows foreign entrepreneurs to start a business in Singapore. This new video production house will be focused on creating Facebook videos for clients, and the 27-year-old Harvard graduate is confident that it will be “one of the best, if not the best” company for creating such videos. “If you’re a start-up looking for good videos that explain what you do… you should probably go with the Nas Daily company, because (it) lives and breathes Facebook videos,” he told TODAY in a phone interview from Israel. With a deep-seated passion for churning out Facebook content, Nuseir expressed his ambition to secure a “big office right next to the Facebook office in the big Marina (One) Tower”. “It’s just a matter of time until we get there,” he added. He also intends to double his staff headcount and is looking to hire about five more people to join the Nas Daily Media Company in the “next few months”. Regardless of this new endeavour, Nuseir said that he will continue to regularly publish videos on his Facebook channel to “keep [it] alive”. But Why Singapore After All The Criticism? While fans rejoiced at his decision to relocate here, there are also many others who were unhappy at this move. 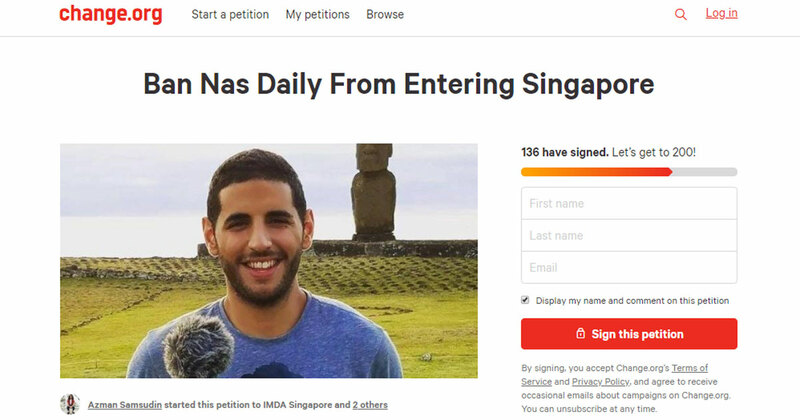 In fact, a petition calling for Nas Daily to be banned from entering Singapore has been posted on the Change.org platform. It was started on March 20 by an Azman Samsudin, and is addressed to the Info-communications Media Development Authority (IMDA), Prime Minister Lee Hsien Loong, and the government of Singapore. Nuseir has received flak for his ultra-positive videos on Singapore, which were accused of being paid for by the Government. To this, Nuseir has stepped forward to clarify that he was not sponsored to produce them and that he simply wanted his videos to “focus on the positive”. With regards to his move here, Nuseir emphasised that he is “self-funding” the company’s relocation. He explained that he chose Singapore as the headquarter because it is near to the countries he intend to visit next, such as Australia, China, India and Vietnam. Besides that, the “straightforward” tax system, good Internet connection and business-friendly environment made it a no-brainer, he added. If you’re building a business, that’s the kind of environment you’d want to be in. Besides setting up his company here, Nuseir also plans to host an annual “Nas” summit or conference in Singapore. “Nas means people in Arabic. So this conference will be all about the people of Singapore, by the people of Singapore,” he told TODAY. While the conference’s name is still not confirmed, he plans for the day-long event to be held in the same week he arrives. It will be a non-profit venture and will likely to be a “money-losing event”, he added. Regardless, he is intent on beginning his journey in Singapore this way. I want to bring the average Singaporean, the rich Singaporean, the poor Singaporean together for one day and just talk about the story of Singapore. The good, the bad, anything. Everybody gets a chance to share something with everybody.